Criminals launched a massive cyber assault on Dyn, one of the United States’ critical internet infrastructure companies earlier this Friday. As reported in a continually updated piece, the DDoS attack lasted for hours, causing outages and sluggish speeds for many of Dyn’s customers, which include some of the biggest companies in the world. A distributed denial of service (DDoS) is when an attacker sends a large number of packets to the target website. Using hacked or improperly configured devices, cyber criminals can use millions of these insecure devices to send a flurry of traffic to the target. The servers are overwhelmed by this garbage traffic, and ultimately can’t handle the legitimate traffic that they receive. This creates slow speeds or completely shuts down the websites. Today’s attack was more complex as Dyn manages DNS services of a number of large companies. The Domain Name System is how computers translate a human-readable web address into the correct machine code, linking to the intended website. Every time you visit a website or send an email, your computer is sending a DNS lookup request to your ISP to route the traffic to the target website. Because the attack targeted Dyn, that in itself manages a number of sites, the staggering DDoS attack managed to take huge swaths of the web offline, disrupting popular sites like Twitter, Netflix, Spotify, Reddit, Visa and several others. We saw a number of theories on Twitter, from linking the attack to the US government trying to limit access to the Wikileaks, to Russia retaliating against US accusations. Details have now started to emerge about the nature of the attack, and it seems that the Internet of Things and vindictive hackers are to be blamed. There is no evidence to indicate if the attack indeed was a retaliation to Madory’s talk about DDoS and Mirai, but at this point, it looks highly likely. Mirai is one of the two malware families that are currently being used to launch IoT-based DDoS attacks. Think about IP cameras, routers, printers, video recorders, and other Internet of Things. The malware essentially scours the web for IoT devices that have close to no security protections with factory-default usernames and passwords, and then enlists these devices. Creating a botnet, millions of these enlisted devices spread geographically throw junk traffic at the intended target, until it can no longer serve the legitimate visitors. Hackers leaked the source code of this extremely effective malware, earlier this month. This malware essentially turns IoT devices into weapons to launch DDoS attacks that cripple the services. 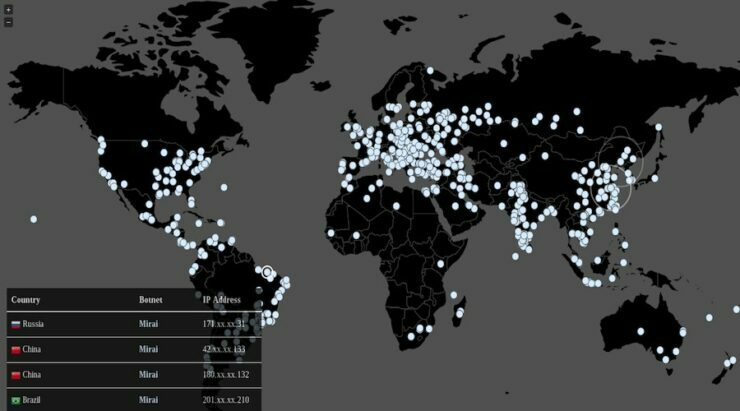 Following the release of this malware online, malicious hackers and criminals started creating their own “botnets.” Reports published ahead of today’s high-level attack had claimed that as many as 500,000 devices are infected by Mirai. Level 3 Communications, one of the world’s largest internet backbone providers also confirmed Mirai’s usage in today’s assault. “We are seeing attacks coming from a number of different locations. We’re seeing attacks coming from an Internet of Things botnet that we identified called Mirai, also involved in this attack,” Dale Drew, chief security officer said on a livestream on Friday afternoon. “What they’re actually doing is moving around the world with each attack,” Kyle York, Dyn Chief Strategy Officer said Friday afternoon. The creator of Mirai released the code to the public, guaranteeing an increasing number of DDoS attacks. Using the nickname “Anna-senpai,” the hacker said that they were releasing the code in response to increased scrutiny from the security industry. Following the release, the malware is growing at a speed that cannot be easily contained. While appearing to be altruistic, the free availability of Mirai ensured that investigators cannot track the perpetrators. Any hacker, independent or state-sponsored could be behind today’s cyber assault. Anticipating what we witnessed this Friday, last week the US Computer Emergency Readiness Team (CERT) had warned of the upcoming DDoS attacks powered by botnets made of IoT devices. US-CERT predicted more attacks following the public release of Mirai. The prediction has unfortunately proven to be unnervingly accurate. Friday’s East Coast attack paints a scary picture of stronger DDoS attacks in the future. If hackers are able to take down large swaths of the internet whenever they want, our free and open internet as we know it will become more vulnerable to cyber criminals, state-sponsored or otherwise. GitHub Hit with the Biggest DDoS Assault Ever Recorded – No Botnets, No Malware Used!